The Friends of Lincoln Park get the Weed Out! I am excited to be joining the IISG team as a social science research intern with Caitie Nigrelli. This May I graduated with a degree in Natural Resources and Environmental Science from the University of Illinois. I enjoy working with people and helping others to understand the importance of sustained environmental quality. During my time as an undergrad, I worked in two social science labs where I realized my passion for environmental social science research. I became interested in the IISG internship because it would combine this with my love of aquatic ecosystems. Through my internship with IISG I hope to improve my research and communication skills, as well gain experience working with communities. Saturday, May 30 was my first opportunity to get out in the field and get my hands dirty, literally! Caitie and I traveled north to Milwaukee, joining forces with volunteers from Friends of Lincoln Park and The Park People on a morning Weed Out. 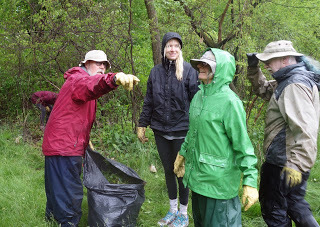 Dedicated community members and a plant expert from Milwaukee County Parks worked through the rain to remove garlic mustard and other invasive species from wooded areas within Lincoln Park. A native to Europe, garlic mustard was brought to the states as a salad green and for its proclaimed medicinal properties. It now dominates the understory of Midwestern forests as an invasive, excluding almost all other herbaceous plants and destroying vital mycorrhizal fungi from the soil. The Weed Out was followed by a cook out provided by Environmental Quality Management, the primary construction contractor on this Great Lakes Legacy Act site, where volunteers had an opportunity to gather and meet members of the cleanup crew. Everyone, besides the lone vegetarian (me), enjoyed Milwaukee style brats, (I savored the coleslaw) while kicking back with neighbors and new friends alike after a morning well spent. Lincoln Park is part of the larger Milwaukee Estuary, a federally designated Area of Concern. Saturday’s restoration event contributes to the work being done in Lincoln Park under the Great Lakes Legacy Act to remove contaminated river sediment, which remains after decades of industrial pollution. The current cleanup targets the river in the eastern half of the park and is the last phase of the Lincoln Park sediment remediation. Creation of The Friends of Lincoln group is a promising sign of the neighborhood’s reinvestment in this beautiful piece of nature. It was truly energizing for me to see such a diverse group of community partners coming together to improve this local public space as a direct result of the river cleanup. I really enjoyed my time working with this welcoming group of people and getting to know some of what the Milwaukee River has to offer. My roommates and I will also be eating a little healthier this summer with the tomato plants and the garlic mustard pesto recipe I got to take home! Top photo: A Friends of Lincoln Park member points me to some additional areas for cleanup. Middle photos: The before and after–Caitie worked to pull this garlic mustard. Native plants now have room to breathe! Bottom photo: Some workday participants enjoy good food and conversation courtesy of Environmental Quality Management, the primary construction contractor.